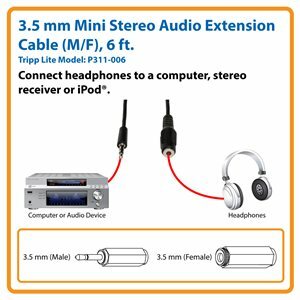 Tripp Lite’s P311-006 3.5 mm Mini Stereo Audio Extension Cable for Speakers and Headphones lets you extend your listening distance. Connect the cable’s male end to your computer, MP3 player, CD player, video game system or stereo receiver and the female end to your headphone cable to extend it by six feet. The extra distance will allow you to move around the room with greater flexibility while listening to your favorite tunes, watching a movie or cranking the sound effects during an intense gaming session. Note: The P311-006 does not function with headphones that have a built-in microphone. If you don’t use headphones, you can also use the P311-006 to extend the distance between your computer and your speakers up to six feet to take better advantage of the room’s acoustics. The P311-006 features braid shielding to deliver high signal quality and protection from EMI/RFI interference. Nickel-plated connectors offer optimal connectivity. Fully molded ends and integral strain relief guarantee long life and durability. The flexible PVC jacket makes the cable easy to install in space-restricted areas. The P311-006 comes with a lifetime warranty. It’s manufactured in compliance with strict RoHS specifications, reflecting Tripp Lite’s commitment to environmental responsibility. Increases music listening distance from your headphones or speakers by 6 ft.
P311-006 3.5 mm Mini Stereo Audio Extension Cable for Speakers and Headphones (M/F), 6 ft.